You wish to travel in Russia or in one of the countries of the CIS, but the thought of carrying out the formalities relating to the visa gives you cold sweat? You can gather one by one all the documents; make many return trips, spend hours in queues at the various counters. Or you can just contact us! Indeed, we are approved by the Ministry of Foreign Affairs to issue the visa as well as the invitation and the detailed program of your stay necessary to obtain it. We take care of everything within very short time frames. So, relieved? 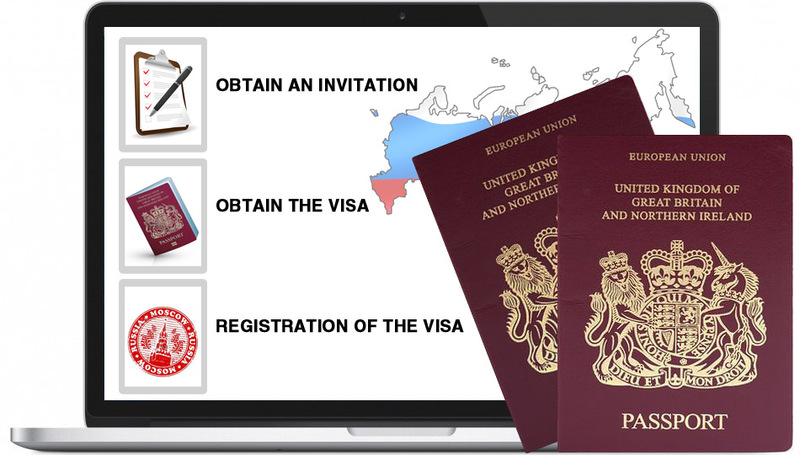 You must previously have an invitation in order to apply for a visa. There are five types of invitations and thus of visas for Russia: tourist, business, study, private and transit. For a stay of more than 3 days, we recommend to opt for a tourist or a business visa, more advantageous in terms of price and duration. The tourist visa is the best option if you do not plan to stay more than a month and if you need only a single entry. It contains two parts – the tourist Voucher and the welcoming confirmation for the foreign citizen. In the case of the business visa, a business invitation delivered by the Ministry of Foreign Affairs is compulsory. It can be single / double / multiple entry and valid for a period for month to1 year. the citizens of the Shengen area as well as those of Switzerland (except UK, Ireland and Denmark), have to supply a certificate of their health insurance stipulating that they are covered in Russia for medical expenses and for repatriation or the whole period of their stay. Once arrived on the Russian territory, you have to register your visa (a simple stamp apposition on your passport). Should the opposite occur, you may be fined by border police when leaving. You have to make it within 7 working days only if you stay more than 3 days in the same city. We want warn you that rules relative to the registration are, unfortunately, subject to interpretation. Then, we advise you to ensure doing it as soon as possible after your arrival, and in all cases. If you stay in a private home or in campsite, etc., the owner of the accommodation has to register you in the central police station. However, if you order your invitation from us, you can also register in one of our agencies wherever in Russia and in Ukraine. In all cases, if you stay more than 3 months in Russia, the recording must be made in a local office of the UVIR (Migration police). The agency which undertook to provide your invitation can assist you in this process.